The iFit Axis HR is iFit’s latest wearable fitness tracker that is the perfect gift for any dad who loves being active and staying fit. The iFit Axis HR tracks everything from your everyday activity to your high-energy workouts. The iFit Axis HR has advanced heart rate tracking and move ready technology. It has three optical heart rate sensors that allow you to monitor specific pulse points on your wrist and view your heart rate statistics at any time of the day. It not only tracks your heart rate during workouts, but also tracks your resting heart rate too. As well as tracking your heart rate during your workouts, it also monitors how many calories you have burned. The Axis HR also monitors your sleep. The tracker’s MoveReady™ technology means you can track your sleep patterns including light, deep and REM (rapid eye movement sleep). This wearable tracker also syncs smoothly with the recently launched iFit Coach app which is downloadable for free for iFit users. This app delivers a personalised service which means members can receive expert recommendations on exercise, activity, nutrition and sleep. It provides a daily fitness plan, which adapts continually based on the data it acquires from the tracker. This feature is brilliant and gives meaning to the stats it acquires. For example, if you have had too much for lunch the iFit Coach will suggest ways to burn the extra calories. This is a brilliant feature and will really help you learn how to maintain a healthy lifestyle. 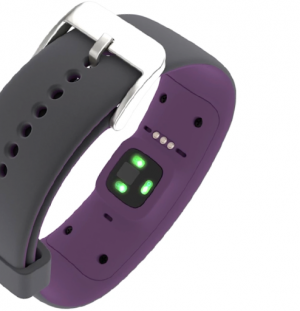 Other great features of this wearable tracker are that it is water resistant and has a 5 day, rechargeable battery. You can also get call and text notifications straight to the Axis HR. The iFit Axis HR has a wonderfully sleek design and a user friendly touch screen. It is very comfortable to wear and looks very stylish. The two tone band comes in 3 colours; black, grey or plum. The iFit Axis HR is a fantastic Father’s Day gift and will be loved by any dad who wants to keep fit and healthy. The RRP is £129.99 and it is available from www.argos.co.uk.